East London Lines has more. (I’m not in London this week, so will be more behind the news than usual – sorry). We do sell to the supermarkets, but by the time it gets to your fridge, even though it says fresh on the label, it can be 7 days old. 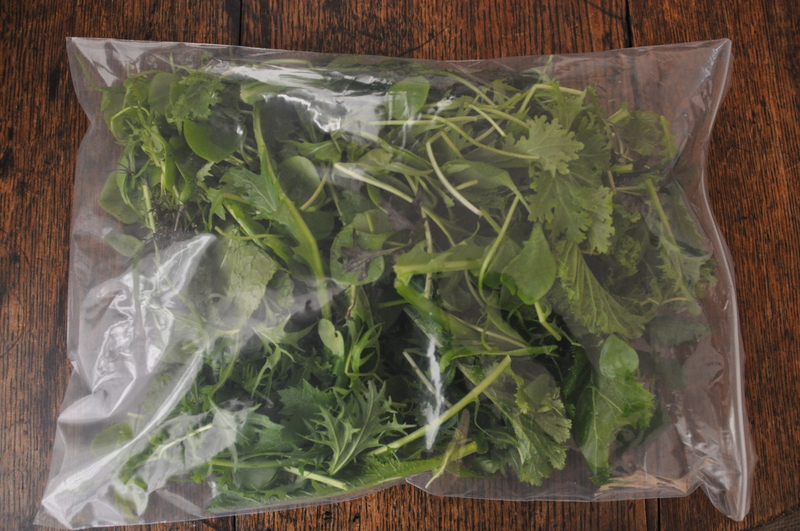 Supermarket salad is kept fresh looking by using a “protective atmosphere” inside the bag. The air in the bag has different levels of carbon dioxide, oxygen, and nitrogen, to slow the speed at which the bacteria can grow. So after it is opened, it suddenly starts to act its age! Felicity Lawrence’s book Not on the Label is a great place to read more about this. Also, the salad shown in the top photo lasts the two of us for most of a week. So we can buy the amount that we need, not the amount the supermarket wants to sell. I should point out that I didn’t compare to the cheapest Sainsbury’s salad bag (0.74p per gram), because the taste of the salad isn’t comparable. The one from the farmer’s market tastes amazing, is organic, and lasts a week! The parsley is much more of a bargain. 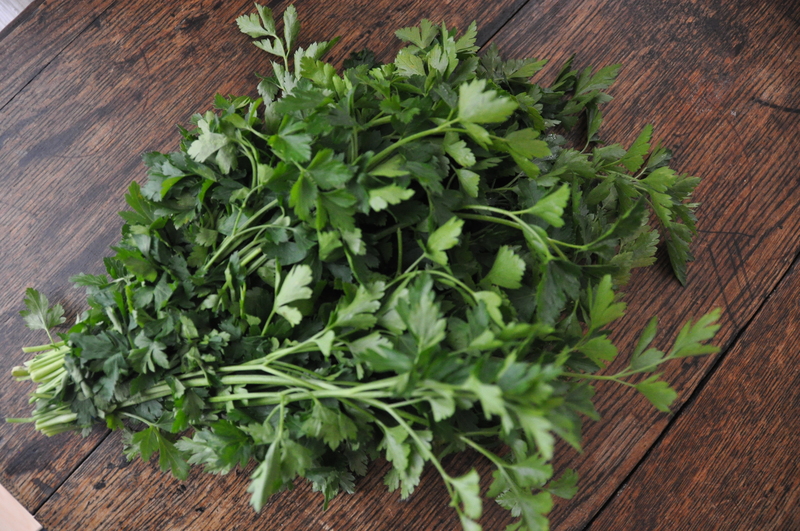 We get loads of parsley each week, so Sainsbury’s can’t compete here. The parsley is from the “hello duck” stall. I like them. Nobody calls me duck in a supermarket. I compared to Sainsbury’s because it’s my nearest supermarket, and it isn’t massively up-market. It’s worth pointing out that other processed foods in the farmer’s market aren’t such a bargain, but staples, veg, and unprocessed foods really can work out much cheaper. Library going, but what about the square? What are the odds that now the library is out of the way, the property developers re-apply to build the Library Square, but this time sans the pesky Library? Who is offering the £500k investment into Age Exchange, in return for moving the library? What are the connections between the Blackheath Society, and the Library Square property developers? All over the borough of Lewisham services are threatened and people being thrown out of their jobs because the Labour Mayor is accepting the Tory/Lib Dem cuts and has chosen to put sacrifice our vital services. Here is the list of places where you can show your strength of feeling. There will be petitions, leaflets, balloons, songsheets. Make a placard to show your disgust at Steve Bullock’s priorities. Dress up in a costume. Bring your old saucepans, kettles, whistles, drums to make a noise at 12 noon! Ok, so it’s technically Greenwich, and I don’t normally do gig reviews, but it was so good I’m going to mention it anyway. The Deptford Rivieras are a great live band. And they play for free at the Mitre Pub in Greenwich semi-regularly. 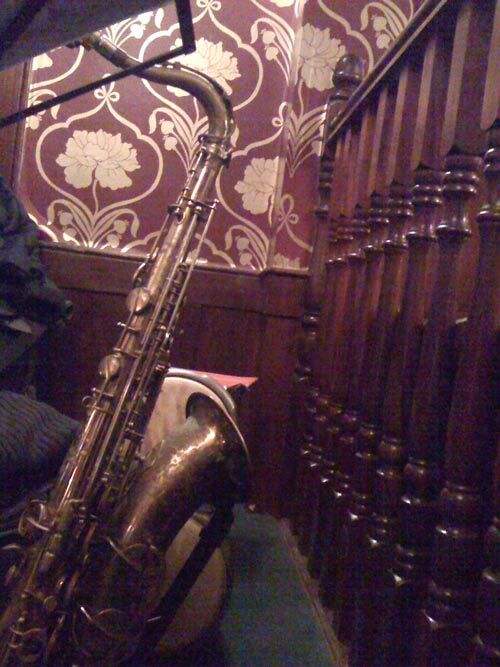 Sax, hammond and drums. Really accomplished stuff. Brilliant fun. Great pub, good beer, loud but not too loud. Just great. The next gig is on Friday February 18th at the Mitre pub in Greenwich. (Almost opposite the Picture House cinema). Have a look at their site, but don’t trust the recordings! This is a live band, and the recordings just don’t come close to how much fun they are to listen to. The film above shows a “house of tomorrow” somewhere in Blackheath. It was filmed by Pathe in 1957. Olly emailed me, asking if anyone knows where it is. Do you? I’d assumed it could be a Span House, but I’m not sure. Click the image to view, and try to ignore the irritating pre-roll advertisements. Terrible website for some great old newsreel clips.